In my first column on jury nullification, I applauded ordinary citizens for producing a not-guilty verdict when the federal government tried to impose bad U.S. tax law on a Swiss banker who lived in Switzerland and obeyed Swiss law. Simply stated, borders should limit the power of a government. In my second column on jury nullification, I approvingly wrote about how citizens on another jury rebelled against the government’s persecution of western ranchers (while also noting that dramatically reducing government land ownership would be the solution to the underlying controversy). To be sure, I don’t think jury nullification is the ideal way of dealing with over-criminalization and abusive law enforcement. It would be much better to repeal bad laws and get rid of the bad people working for government. But until those things happen, I’m glad nullification exists as a last line of defense. Now let’s look at a third example. Except it’s probably more accurate to say it’s an example of pre-jury nullification. Here are some excerpts from a heartwarming story from New Mexico (oops, I mean Arizona…I blame Chuck Asay!). You may have heard that saying: If prosecutors want to, they could get a grand jury to indict a ham sandwich. It’s a knock on how much control prosecutors hold over the grand juries to whom they give evidence for possible indictments. The 269th Pima County Grand Jury could not be controlled like that. …this one was led by a criminal-defense attorney and populated by freethinkers who took to heart their role as “conscience of the community.” They went so far as to decline to indict people even though there was enough evidence to show probable cause, foreman Natman Schaye and others told me. That, in essence, is grand-jury nullification — not carrying out the law because, in the jury’s opinion, it is unjust. This grand jury, which was labeled as “The Notorious 269th” by the press, decided that justice was more important than obeying the government. Here’s some background info on the role of the grand jury. Grand juries have their roots in 12th-century England, but in early America took on more of a judicial role — that of a body of citizens standing between the government and a person accused of a crime. The grand jury eventually came to stand as a check, ensuring the government had enough evidence to pursue a criminal case. …Prosecutors run the grand-jury sessions… They bring proposed indictments to the jurors and call police officers as witnesses, without a defendant or a defense attorney present. The grand jurors, though, make the ultimate decision as to whether to indict, and on what charges. Unsurprisingly, government officials don’t approve of grand jurors exercising independent thought. As to the grand jurors’ decision to reject some cases with adequate evidence, Acosta said that really isn’t their place. They take an oath to follow the law before taking their seats, she said. “If somebody has a particular agenda, I suppose they can go to the Legislature and say, ‘We don’t like this law, maybe you should change it.’ But the grand jury isn’t the place for that kind of activity,” she said. Sorry, Ms. Acosta, that’s not right. The grand jury (or regular jury) may not be the ideal place to protect against injustice, but it’s better than nothing when governments have bad laws and/or government officials abuse citizens. If you don’t believe me, just ask Andy Johnson, Anthony Smelley, the Hammond family, Charlie Engle, Tammy Cooper, Nancy Black, Russ Caswell, Jacques Wajsfelner, Jeff Councelller, Eric Garner, Martha Boneta, Corey Statham, James Slatic, Carole Hinders, Salvatore Culosi, and James Lieto, as well as the Sierra Pacific Company and the entire Meitev family. There’s a philosophical principle involved. In many cases, nullification is appropriate because governments have criminalized actions that have no victims. Which is why the movement’s motto, as noted in this Ron Swanson meme, is that there is no crime when there’s no victim. I’ll close on a personal note. I’ve lived in Fairfax County for almost three decades and I’ve only received one summons for jury duty. When that happened, I immediately fantasized about being a hero and using nullification to block an unjust gun prosecution or unjust drug prosecution. But it turned out that the case was a lawsuit between a contractor and consumer, so I was happy they wound up finding enough people before my name was called. But maybe my nullification fantasy eventually will become a reality. Though I’ve noted that my fantasies (at least the ones involving public policy) never seem to happen. Years ago I served on a grand jury in Virginia. The prosecutor presented a case where the defendant had defaulted on a payment plan provided by a furniture retailer. As we were deliberating the matter, we called the prosecutor back in to confirm that it was a crime to default on on an installment plan used to buy a piece of furniture. He opened the statute book and read the law to us. Yes indeed, it was illegal to default on an installment plan used to buy a piece of furniture. The law said nothing about defaulting on an installment plan used to buy any other items. Had the defendant bought the furniture on his credit card and then defaulted, it was not a crime. We unanimously refused to indict him. The probable cause standard means different things to different reasonable people and doubt is an implicit part of the review process. The beyond a reasonable doubt standard may be less clear because it invites each juror to acknowledge that some doubt exists. Jury nullification (not following the law) should be reversed on appeal by jurors who refuse to condemn in the face of doubt should be praised. 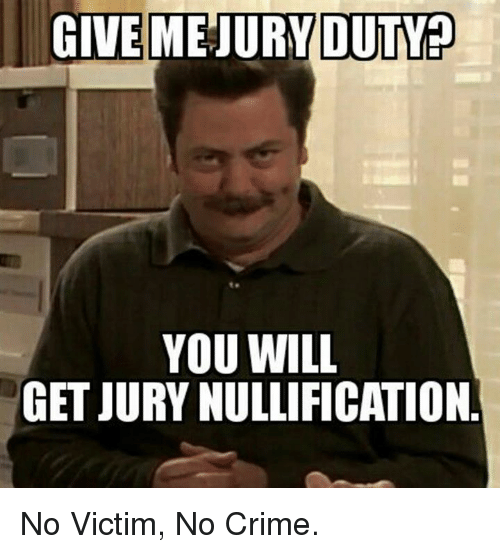 I agree there is a place for jury nullification. But show me with trace amounts of drugs and its doubtful that law enforcement was targeting a casual user. 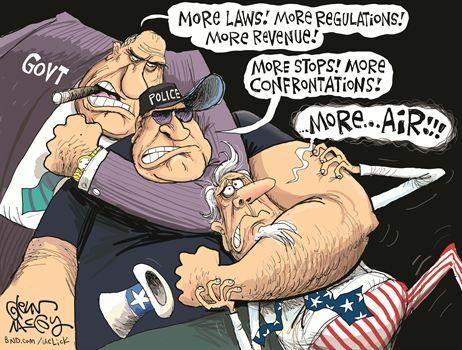 Some people just dislike laws because it makes earning a livelihood difficult, like drug dealing. What do you think exists in ghetto areas? Black juries will not convict a black regardless of the evidence. Perhaps you missed the Dan Francisco verdict, composed of a jury that included, gasp, illegal aliens!